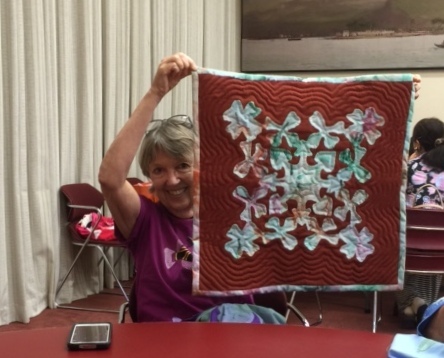 July 2016 - Hawaiian Quilting With Poakalani & Co.
Hawaiian Quilting With Poakalani & Co. The Poakalani & Co. Website was started in 1996 to share with the general public our Hawaiian quilting experience. We felt that we needed to share not only the finished quilts but also the cultural and especially the teaching aspects of Hawaiian quilting. It was our greatest desire to inspire and encourage others to pick up their own needle and thread and begin their own tradition and cultural legacy. By doing this it is helping to fulfill our mission to preserve the "Art of Hawaiian Quilting". We would like to thank all the quilters for allowing us to share their quilts on this website so we can continue to inspire others to help preserve not only their own personal story and tradition but one of Hawaii's most treasured Art. No Class July 16. Sorry I hate when this happens. 22" x 22" Quilt Designs, Design First, News & Updates Comments Off on No Class July 16. Sorry I hate when this happens. No Class July 16. Everyone please mark you calendars. We will return on July 23. Yes, I’m sad too but until then enjoy this amazing wall hanging quilted by awesome Susan. The Dogwood. Temporary Venue – Ohana Hale Market Place 333 Ward Avenue ( Old Sports Authority) 9:30 – 11:30 First Class $15.00. Thereafter only $7.00. Call 808-223-6608 for more information. Looking for a Hawaiian Quilt for that "Special Someone" or needing to complete a "Closet Quilt " from generations ago. Well Pat sells and makes commission quilts. Please check out her personal page for quilts and more information.